As part of their Doctor of Audiology (Au.D.) 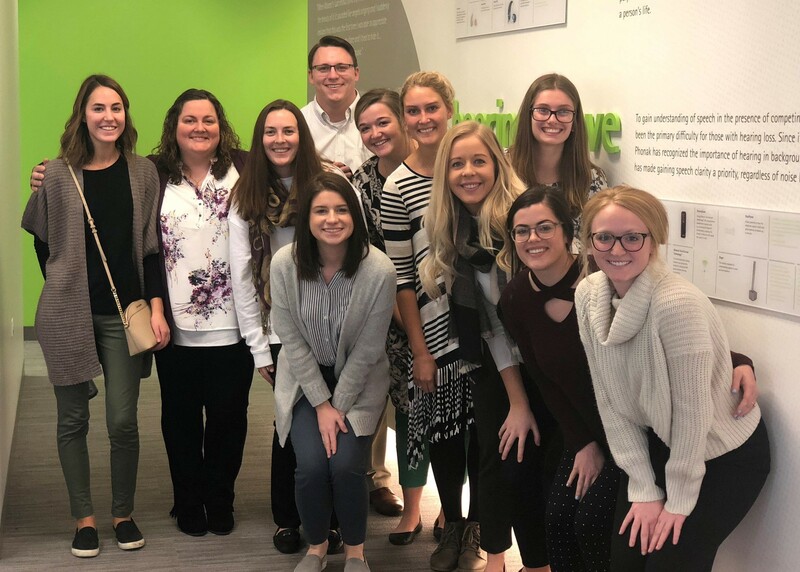 training with Assistant Professor Nic Stanley, first year Illinois State University students visited Phonak, a hearing aid manufacturer located near Chicago. Students were invited to see the Phonak Audiology Research Center (PARC) where they toured the comprehensive research facilities and learned about Phonak’s research endeavors. Additionally, Illinois State’s AuD students participated in Phonak’s “Hearing is Believing” demonstration where they listened and compared Phonak’s newest hearing aids to other manufacturers. The trip to Chicago contained a tour of Sonova’s Aurora Operations and Development Center (AODC) which serves as a production and repair facility for several hearing aid manufacturers: Phonak, Unitron, Hansaton, Advanced Bionics & Audeo Nova. At this facility, students were guided through Sonova’s process of receiving and fulfilling hearing aid orders and repairs. This experience was intended to educate students about hearing aid manufacturer research and production processes, and the role it might play in their future clinical endeavors.